Alvsjo is a beautiful area in the southern part of Stockholm. There are charming cafés, restaurants and green areas. This is the perfect place to stay when visiting an exhibition or an event at Globen or Tele2 which are located about 10 minutes away by car. If you’re off to Stockholm City or Sodermalm, the commuter train will get you there in 9 minutes and 6 minutes respectively. Start your day with a jog around the area, enjoy a delicious and nutritious breakfast, and round off your day with a delicious dinner in our restaurant. If you get the chance for a moment’s relaxation, we recommend our lobby bar or our Sky Bar on the 19th floor with its beautiful views. Our lobby bar has an area where kids of all ages can play and enjoy PlayStation games. We can offer meeting facilities for up to 200 people if that’s what you’re looking for. We offer everything from a boardroom and training facilities to a conference room with private bar and terrace on the 19th floor. Our Sky Bar is also available to book for private parties and functions. Ideally located just a few steps from Stockholmsmässan and a 10-minute journey from the city by commuter train, which is within walking distance. Shopping centres such as Kungens Kurva, Skarholmen and central Farsta are just a short car journey away and for those looking to reach new heights, Karbin indoor rock-climbing gym is close by. If outdoor activities are for you, there are also large green areas close by. There's something for everyone here. Enjoy a delicious dinner in our Bistro and a fresh salad buffet for lunch. Breakfast is served on the 2nd floor. 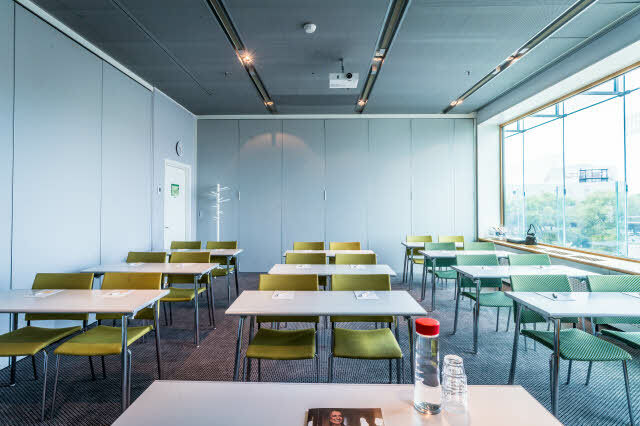 Hold your meeting in our modern conference facility, situated right next door to Stockholmsmässan in Alvsjo. Order a delicious drink in the evening and enjoy views offered by our Sky Bar on the 19th floor.